Democratic candidate Bernie Sanders gave frontrunner Hillary Clinton a piece of his mind in the most vigorous of their four presidential debates, accusing her of cozying up to Wall Street and accepting hundreds of thousands of dollars from big banks. 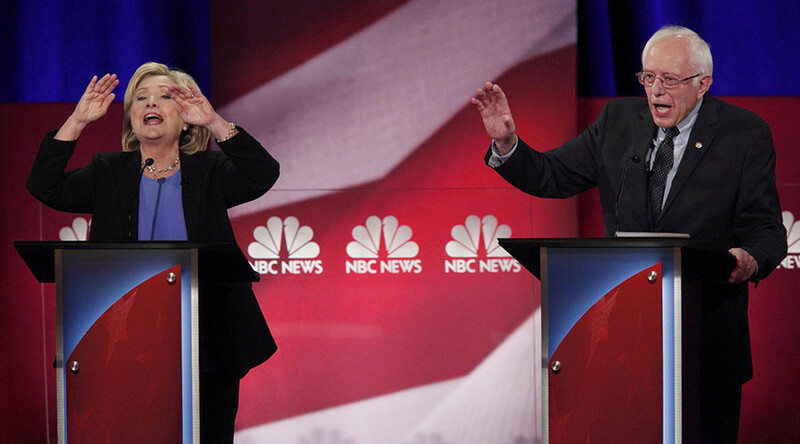 "The first difference is I don’t take money from big banks,” Vermont Senator Sanders said. “I don’t get personal speaking fees from Goldman Sachs. I have huge doubts when people receive money from Wall Street," he added. According to a detailed summary of Clinton's financial and health record campaign, she received a total of $675,000, for three separate speeches to Goldman Sachs in 2013 (in South Carolina, New York and Arizona). Sanders is the prime mover in this debate. He speaks on issue, ojher candidates -- including Clinton -- react. “You’re the only one on this stage that voted to deregulate the financial market in 2000, to take the cops off the street, to make the SEC and the communities – the Commodities–Futures Trading Commission - no longer able to regulate swaps and derivatives, which were one of the main cause of the collapse in ’08. So there’s plenty,” Clinton replied. “The final thing I would say, we’re at least having a feverish debate about reining in Wall Street,” she noted. Clinton pounced on Sanders for voting repeatedly with the National Rifle Association (NRA) and welcomed his weekend reversal of position to support legislation that would deny gun manufacturers legal immunity. She mentioned a list of provisions that she claimed Sanders had supported in line with the NRA. “I have a D-minus voting record from the NRA” he pointed out. “I have supported from day one an instant background check to make certain that people who should not have guns do not have guns. And that includes people with criminal backgrounds, people who are mentally unstable. I support what President Obama is doing in terms of trying to close the gun show loopholes,” Sanders added. Discussing national security, both Sanders and Clinton voiced support for Obama’s diplomatic decisions on Iran and his opposition to sending US ground troops into Syria. Moderator Andrea Mitchell asked whether the US president was right not to act on his “red line” vow regarding his Syrian counterpart Bashar Assad and the use of chemical weapons. “I know from my own experience as secretary of state that we were deeply worried about Assad's forces using chemical weapons because it would have had not only a horrific effect on people in Syria, but it could very well have affected the surrounding states - Jordan, Israel, Lebanon, Turkey. So getting those chemical weapons out was a big deal,” Clinton said. “If there is any blame to be spread around, it starts with the prime minister of Iraq, who sectarianized his military, setting Shia against Sunni,” she noted. “I think that the president's decision to go after the chemical weapons once there was a potential opportunity to build on when the Russians opened that door resulted in a very positive outcome. We were able to get the chemical weapons out,” Clinton said. When asked whether she would give another ‘reset’ button to Vladimir Putin, Clinton replied evasively. “It would depend on what I got for it. Clinton mentioned that when Putin reassumed the presidency, he accused her of fomenting dissent. How would she describe her relationship with Mr. Putin these days?